It can be a daunting task to rank the top ten best Halloween toys of all time. Thankfully, the team behind the excellent Netflix series The Toys That Made Us have gone ahead and put together a pretty stellar list, saving everybody some time. As with most lists, there will be some personal favorites that didn't make the cut, which may mean that personal lists will have to be made in time for next year's Halloween. Coming in at number ten on The Toys That Made Us best Halloween toys list is the aptly titled Halloween Monster. According to the experts, this toy was repurposed from another design called the Soma Monster Man from the mid-80s. The Halloween Monster was available for a brief time, and only at Walmart in the early 1990s. At number nine on their list is the awesome 1962 Haunted House three dimensional board game. The game is a three story house that players have to get all the way through, dodging bats, trap doors, and other creatures. The game was way ahead of its time, and is truly a Halloween classic. Number eight on The Toys That Made Us top Halloween toys is the 1982 Epoch Dracula handheld video game. While crude by today's standards, the experts claim that this one still stands up to this day. Players have to obtain the gold from Dracula's coffin while fighting off bats and the Wolfman. Number seven on the list is McFarlane's 1998 Monsters Playsets, which were heavily detailed. The sets are highly collectible, with whole used sets being sold anywhere from $200 to nearly $400 on third-party sites. Number six on The Toys That Made Us best Halloween toys list is the iconic Play-Doh Count Creepyhead Playset. This well take some horror fans back to childhood, and is also highly collectible these days. Who doesn't like creating monsters and then tearing them apart? As for number five, that goes to one of the biggest horror icons in history: Mr. Freddy Krueger. 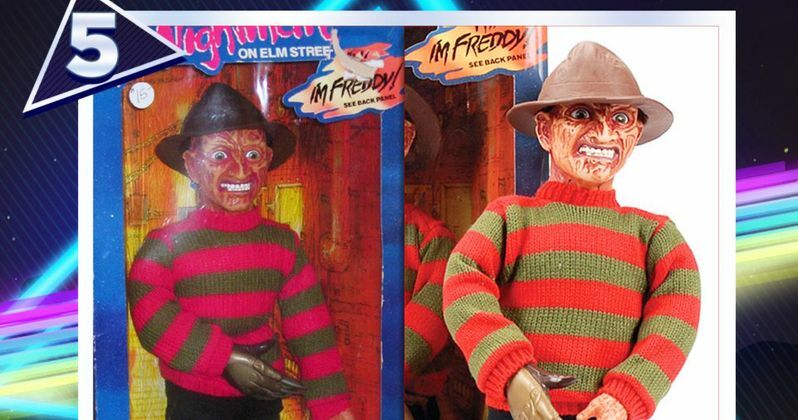 Matchbox's 18" Talking Freddy from 1989 is a must-have for any self-respecting Freddy fan. They're not too difficult to find these days, and often go for around $100 used. Mego's Mad Monster Series from the 1970s takes number four on The Toys That Made Us best Halloween toys list. According to the experts, these Dracula, Wolfman, Dr. Frankenstein, and Mummy toys are some of the best ever created. They can still be found today, starting at prices as low as $20. Number three is the McDonalds Halloween McNugget Buddies, which made their debut in 1992. They were also the stars of the fast food giant's October promotional campaign, and they are sorely missed these days. Number two on The Toys That Made Us list of best Halloween toys goes to the Remco Mini Monsters, and their epic Mini Monster Playcase. The set contains the classic Universal Monsters and can be purchased for around $200 used and upwards of $300 sealed in the box. As for the number one spot, the team has yet to reveal the highly coveted spot as of this writing, so keep checking back for that. For now, you can check out the nine toys on the list below, thanks to The Toys That Made Us Twitter account.